Veeam Backup Enterprise Manager allows for configuring retention settings for the index files, as well as for the event history. If you are using Standard edition of Veeam Backup & Replication in your virtual environment, Veeam Backup Enterprise Manager will keep index files only for those backups that are currently stored on disk (that is, the backups are available on backup repositories). If you are using Enterprise or Enterprise Plus edition, Veeam Backup Enterprise Manager will keep index files for backups that are currently stored on disk and for archived backups (for example, backups that were recorded to tape). 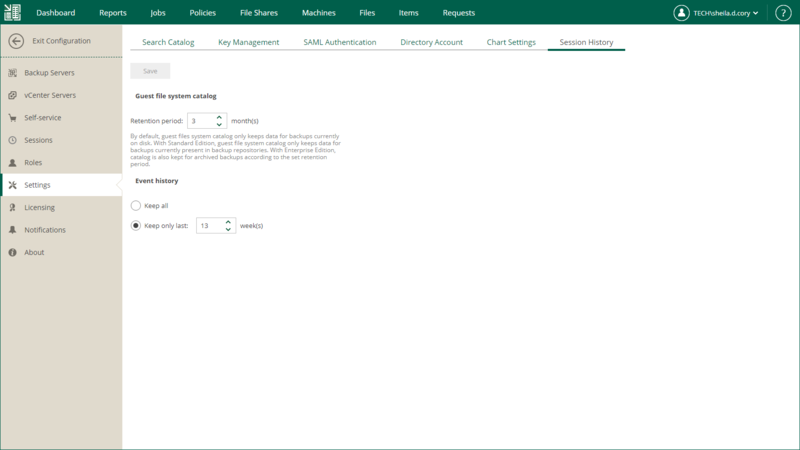 Thus, you will be able to browse and search through backup contents even if the backup in repository is no longer available (that is, it was removed by Remove from Backups or Remove from Disk command in Veeam Backup console; for details, please refer to “Managing Backups and Replicas” section of the Veeam Backup & Replication User Guide). Consider that, by default, backup repository is the primary destination for the search. This means, in particular, that if a backup (with indexed guest) is stored in both locations — repository and tape — then Enterprise Manager search results will only include files from backup stored in repository. Files from tape-archived backup will appear in search results only if not found in the repository. Open the Settings section on the left of the Configuration view. Enter the desired number of months in the Retention period, months field. Default value is 3 months, minimal allowed — 1 month, maximum allowed — 99 months. When finished, click the Save button under the Event history section. New retention settings will be saved in the Enterprise Manager database, and pop-up message notifying you on the update will be displayed at the top of the window. 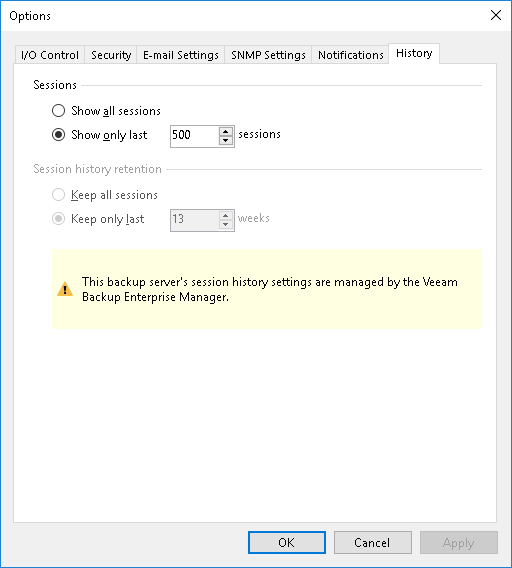 In the Event history section, specify the period for which Veeam Backup Enterprise Manager should keep historical data available in the main working area of the Veeam Backup Enterprise Manager website. Enter the desired number of weeks, or select to Keep all. By default, retention period for session data is set to Keep only last 53 weeks — here 53 is maximum allowed number of weeks, minimal allowed is 1 week. When finished, click the Save button below the section. New retention settings will be saved in the Enterprise Manager database, and pop-up message notifying you on the update will be displayed at the top of the window. Please note that the retention settings you specify in Veeam Backup Enterprise Manager are propagated to all Veeam backup servers connected to it. These settings override the Session history retention values specified at the level of the Veeam backup server. For example, if the retention options of the Veeam backup server are configured to keep the session history for 50 weeks, and in Veeam Backup Enterprise Manager you select to Keep only last 30 weeks, the latter value will be propagated to the Veeam backup server; so the history will be kept for 30 weeks.